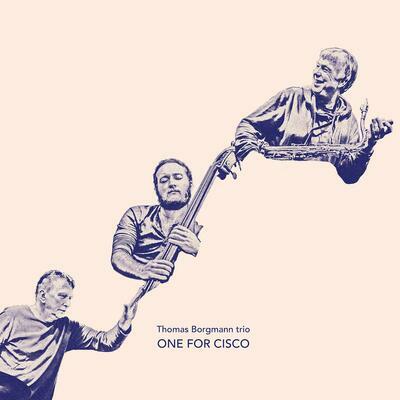 One For Cisco is a fine live recording from the New York Tenor Sax Festival 2015, teaming regular sparring partners Thomas Borgmann and Willi Kellers with the New York bassist Max Johnson, whose The Prisoner inspired suite was a highlight of 2014. The opening moments of this limited edition LP make the listener feel as if they've just walked into a club, as the band starts up a mid-tempo free blues and someone gives instructions in German. Johnson's youthful energy and invention brings out the best in these veteran German players. A solo feature some ten minutes in highlights the sturm und drang of his arco playing, where deep, grinding tones are strafed with harmonics. Kellers gives him space, keeping free time with ride cymbal taps and irregular bass pulses. An increase in drum pressure gives Borgmann the cue to come back in, but he resists the temptation to go full pelt, instead picking up his soprano for an angular improvisation that gradually turns into a brisk free-bop dash. The second side proceeds from understated, abstract beginnings, with Borgmann coaxing shrill whistle-like tones from his soprano. Tumbling tom patterns soon emerge, with Johnson essaying a plaintive melody for bowed bass that turns increasingly stormy. As the rhythm section pulls back from the brink, Borgmann returns with some exploratory tenor phrases that gradually develop into expressive lines. After another mini-climax, it all falls away to a whisper, before Borgmann begins a lyrical improvisation built around echoes of Charles Mingus's 'Goodbye Pork Pie Hat'. Johnson channels his inner Charlie Haden with a vigorous avant-blues strut while Kellers whips up a small storm of controlled tom detonations and splashing cymbals, bringing a final bout of measured free blowing and boppish licks from Borgmann. For the final moments, Borgmann breaks out a melodica, playing a wistful chordal motif while the rhythm section gives it their best Sly & Robbie. A lovely set, artfully presented by treasured Lithuanian label NoBusiness.